If you race long enough, you will certainly meet up with the dreaded DNF. (Did Not Finish) It’s the 800 pound elephant in the room, that no one wants to talk about. DNFing can cause a range of emotions from embarrassment to being just plain pissed off. I just put in X amount of time training, and $$$ amount of money to race, and this is my result. Argghh. At the very least you will be frustrated, and rightly so. Reasons for DNF can be anything, an injury, adverse conditions, or just a really crappy day. Whatever the reason may be, as an athlete you need to deal with that race, and move on. For most of us one bad race will not define you, or your athletic career. Learning to deal with the disappointment from a DNF is a skill that requires mental toughness. Your friends, families, and training partners won’t think less of you for a DNF. Most of us over inflate the importance of our athletic goals in our mind. Take a couple of days to process your thoughts, and then just move on. You only get so many days on this planet, do you want to spend them pouting about some race? Be proud of the work you put in to make to the start line. Plus no one else wants to come to your pity party. When you were a toddler learning to to walk, did you parents let you fall down once, and then decide to not let you keep trying to learn to walk? Of course not, That’s crazy. You learned to walk by continually falling down and getting back up, until you figured it out. The same is true for racing. You may not have hit your goal, but what did you learn along the way. Did you gain some course knowledge? Did you identify your weaknesses? Did you get a sense of the work you need to put in to reach your goal? Don’t let the DNF be a total waste of time and energy. Figure out what you can do better, and crush your next race. There will be valid reasons why you had to DNF. Figure out how you can overcome those challenges, and succeed in your next race. Rationalizing your bad race with a bunch of excuses won’t help the situation, and is harmful to your mental toughness. Focus on the parts of the race that went well, and the things you can improve. If you’re not injured, then find another race to jump in. Don’t waste all of your fitness on that DNF. Find a race that looks like fun, and focus on that. Shift that frustration to motivation for your next race. I’m sure you won’t have a DNF, but if you do, I hope these tips help out. 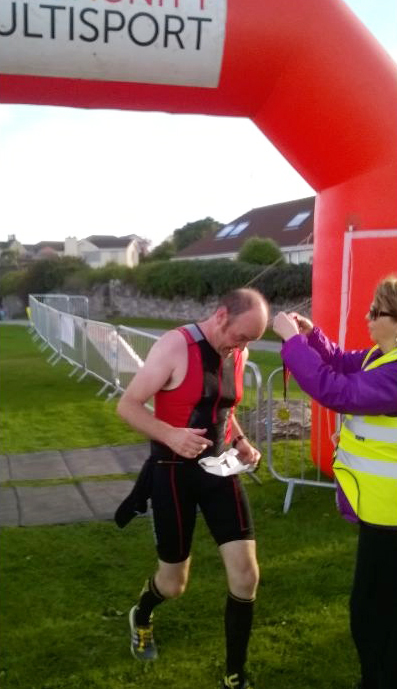 This is me getting my medal as I crossed the line for my first half ronman, the ‘Ireman Triathlon’ in Northern Ireland, 27 Sept 2015. If you are a new or beginner triathlete and would be interested in coaching, please email me at firsttimetri+coaching@gmail.com. John is one of my coached athletes. 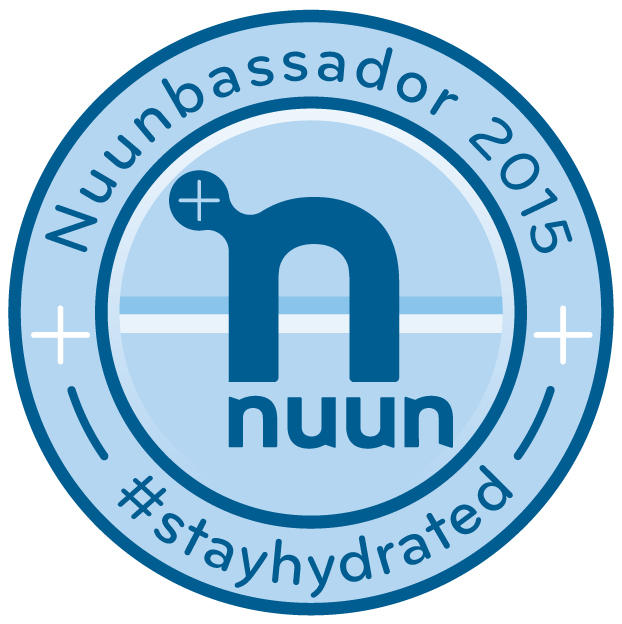 He reached out to me for coaching to improve his fitness going into the Snowman Triathlon. I designed him a 9 week training plan, that he followed diligently. John completed every workout I threw at him with the correct intensity. John made fantastic improvement over the training plan, culminating with a superb race at Snowman. John was an absolute pleasure to coach, and I see tons more improvement for him in the future. 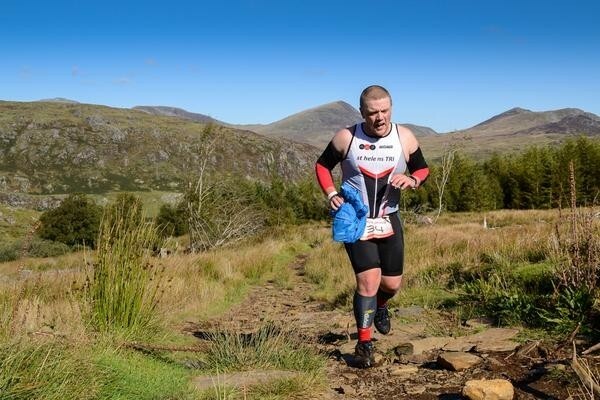 Always Aim High Events hit it out of the park with this race, stunning views of the snowdon horseshoe, beautiful (but cold) lake swim at the national mountain centre at plas y brenin, fantastic fast bike course despite an almost 10km climb back up to T2, and to top it off, a mountain run (ahem, hike) to finish! After a 9 week training plan, that I followed as closely as I have ever followed anything it was time for me to don my new hometown Triathlon club kit for the first time and embark on something quite hard! (understatement of my life) I intend to carry on with training and do the race series the organisers of the snowman arrange every year. Arriving the night before my race and camping less than 5k from the venue was the first plus of my weekend, allowed me to pitch the tent, then make registration the evening before. Allowing me to prep all my kit the evening before the race. Arriving early on race day, I parked my car no more than 500 metres (yet not on the race route) from transition and ambled down to rack my bike and find a much needed caffeine fix. superb marshalls on the entrance to transition made this process nice and smooth. I racked the bike and went for a look around the centre at Plas Y Brenin before heading back to start getting ready. I got my wetsuit on, and got comfortable, checking and rechecking my bike shoes and trail shoes where easily accesible when needed. Then the shout came, 9:50am, we were to head to the lake and swim entrance, I took the plunge early and used the time to get a few strokes in and make sure my suit was well fitted. 10:00am And the hooter goes off, and I set off on my swim, settling into a rhythm early and actually finding it quite comfortable, 8 minutes later I was hauling myself out into the morning sunshine, unzipping the suit as I headed back towards transition. In transition, I took the time to dry my feet and put a pair of trail running socks on before I got the bike shoes on, helmet clipped up, bike unracked, I was running for the mount line, with the encourragement of the event organisers and some crazy local supporters ringing in my ears, I ran past the mount line, and mounted a little way down the road, so as to avoid knocking anyone over. I tightened my shoes, and got my head down. Literally spinning my legs up to 100rpm and speeds in excess of 65kph on the descent to Llanrwst through Betws y Coed. Then, outside a petrol station, I realised my seat post was dropping, Disaster! I was going to lose time, Luckily a fellow competitor stopped with an alan key, seat post put right, I was on my way, a flat loop until the 10km climb back to Capel Curig started at Betws. Still I managed to average 31kph on the bike, and only just went over the hourr for that leg. Approaching transition again, I took my feet out my shoes (well I tried!) and got off just before the line! with the owner of the event company policing the line shouting encouragment I felt awesome getting back to my position. My bike was re racked, helmet took off, I slipped my running shoes on and set off into the un-known! Leaving transition for the final time, I was feeling good, until I got into the tree line. There the path ramped up and I think most people where then reduced to a Hike, through some of the most rugged and brutal terrain I’ve ever seen. After 50 ish minutes, I reached the turn around point, and thats where the fun really began. As it was ALL downhill from here, I started to let my legs go, following the guy in front of me all the way back to tree line, an awesome feeling to descend a mountain at speed, running through boggy muddy sections without a care, and hurtling over rocky outcrops as fast as possible! BRILLIANT! thenI hit the flat forest road, and was speeding along at 4 mins 30 seconds per KM, I got to what I thought was the finish distance at 5k, I was wrong! And I hit a wall, 1.4km later however, and around 2 hours and 20 minutes after jumping in the lake I had crossed the finish line to an amazing sense of achievement. 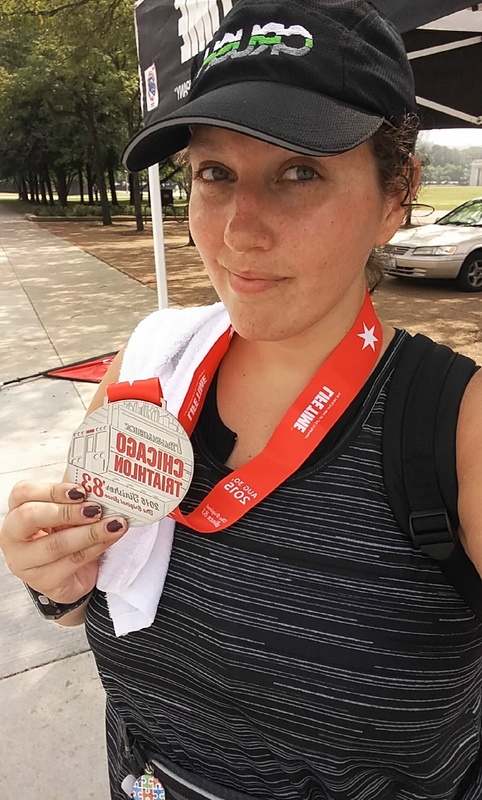 I did it… I completed my first Sprint Distance at the Chicago Triathlon, despite everything that went wrong! I racked my bike the night before and when I showed up to transition in the morning, I was missing my handlebar plugs. They told me I couldn’t ride without them and I began to panic a bit. All that for nothing over some plugs!? I refused to believe that was it. So I triple checked with bike solutions & one of the guys working there ended up taking them out of his own bike for me. All was right with the world again. A few hours later I was entering the water and the horn was sounding just seconds later. I allowed most of the other first timers to go before making my way through the water. I didn’t want to start any breathing issues (I’ve been having a few lately), so I went with a backstroke. I felt really good that way and just decided to keep it that way the whole time. I had about 15 yards left and I flipped over to finish strong. However, I got thee worst charley horse ever in my calf. I couldn’t move my leg at all and it hurt so bad. I had to make my way over to the wall as I cried. My tears were filling my goggles and I just wanted to be pulled up. 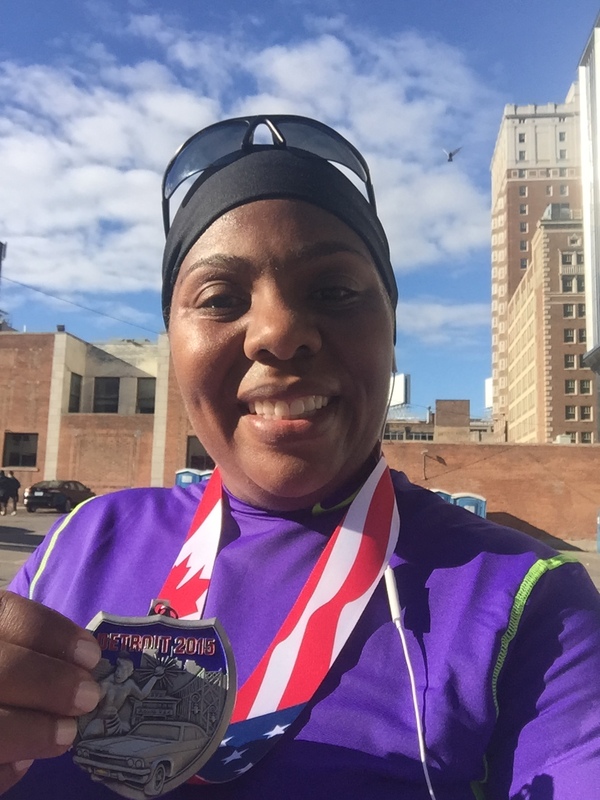 Because I was so close, my family and one of the lifegaurds encouraged me to make my way to the finish line so my timing chip wouldn’t get taken, so I did that. I stopped there to talk to a medic and stretch. It was still really tight but I pushed on. I eventually made it safely back to transition, changed and hustled out… And as I mounted my bike, I realized the chain was off my bike. The nice guy at bike solutions saved the day again! After taking my bike apart to fix it, (it felt like forever) I was on my way. I’m pretty certain there was only 1 other person that started the bike behind me because I was out there all by myself basically the entire time. When I would come across a person, I made it my mission to pass them. I guess it helped me move faster to race them. I think I passed about 5 people the entire bike ride… Other than that, I was alone. By the time I started to run, I thought that would also be a solo journey, but I was able to catch up to a few folks, and again race them. I quickly realized that nobody had respect for the course anymore because there were so many people just walking on it and through it. However, I felt really good on the run, if I ignored my calf. I was cheering on those going past me in the other direction and encouraging those that I passed. Finally, I see the finish line… Move it!! Once I passed it, I could not breath at all and my chest was really tight. I was escorted to the medical tent, taken care of and given a nebulizer treatment because of everything that was happening. Would I do it again? I’ll be in the Athena wave next year for sure! Fantastic job Sam! That was no an easy day! You took each obstacle in stride, and found a way to keep moving forward. You definitely earned that finish. Welcome to (a special follow up) Fantastic Finish Photo Friday. 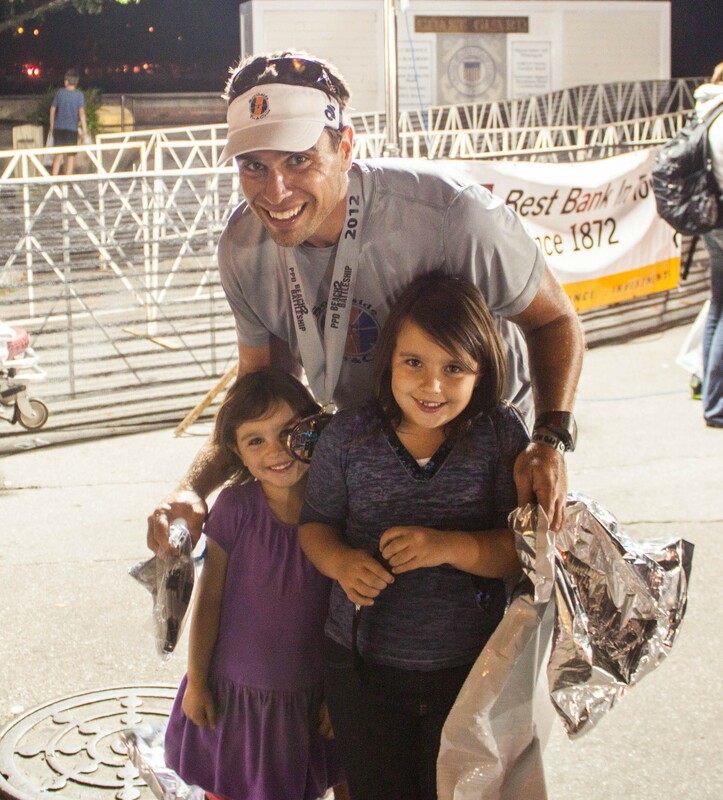 We want to bask in the awesomeness of your finish photos. A finish photo captures a moment in time, where you overcame the challenges of the race and training, and reached your goal. The feeling of elation as you cross the line is what keeps us pushing our own limits. Please consider sharing your own photo to inspire others who are working toward their own finish. 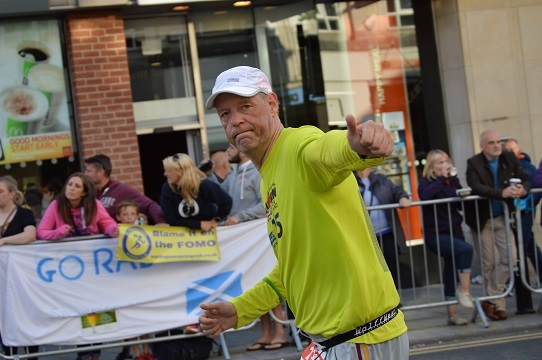 Here are a few collected thoughts from a Hero Hour finisher in my first Ironman triathlon: IronMan UK 2015 in Bolton, England. Hero Hour? The hour for the sixteen hours plus finishers. The slower ones. Me. First of all, let’s get one thing straight. It was brutal. You prepare as well as you can, even to the point of being more than decently fit before I even entered, in August. In preparation, I ran a marathon, biked a 300 km race, swam a 3 km open water race and did an Olympic triathlon. I had also prepared well mentally. The fact is, I needed every last bit of mental strength to bring out the power needed to keep moving. The swim was easy for me, which was a bit of a surprise. The rolling swim start was a great thing that probably helped. But the bike leg sapped energy by the minute from the legs, because of the hills (expected), a very mean wind (not expected to be THAT bad) and the appaling condition of the tarmac (certainly not expected). It felt as though I was biking uphill on a cattle grill for 112 miles. But somehow you had find the energy to keep moving. Keep moving. That was the mantra of the amazing volunteers and people of Bolton. Keep moving Dan! Well done, Dan, you’re doing great! If IMUK was brutal it was equally spectacular. The commitment from everyone around the race was truly amazing and a memory for life. 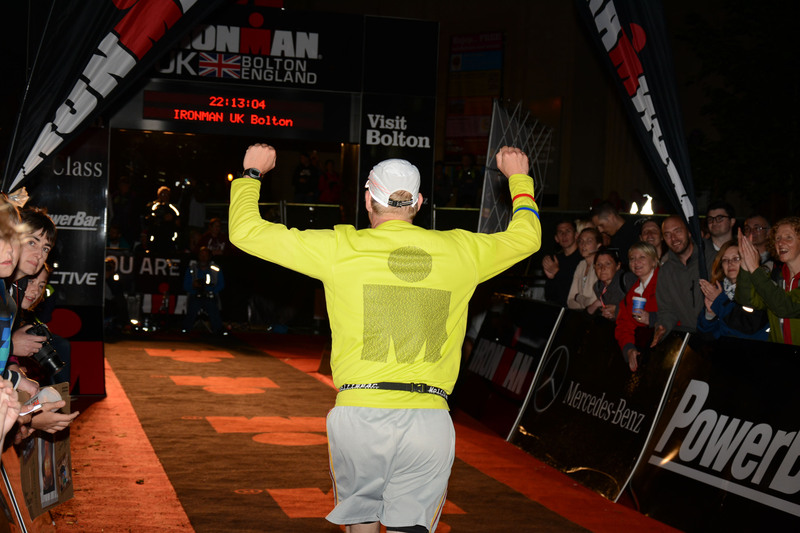 I found a familiarity about doing the IronMan in Bolton that I certainly did not expect. The IronMan community and the people of Bolton come together and really made the effort to get there worthwhile. A steady slow trot, uncomfortable but not painful, and some walking, up and down between historic Bolton and a crescent about 4.5 km away and suddenly, there was the finish line. I arrived with almost an hour to spare to the deadline and the energy to savour the moment. If you decide to do the IronMan UK in Bolton, make sure you know how to fix a puncture. Expect a hilly bike leg that is challenging but with easier winds not too bad. You’ll climb Sheephouse Lane easily if you’ve trained. Prepare for plenty of logistics time with the two transition zones being 10 miles apart and bring a car. Embrace the hurt – it will get very uncomfortable but you WILL be able to make it to the finish line. Everybody else is just as tired as you are, and even at eleven at night, there will be people cheering for you at the finish. Find strength in all people shouting your name and just keep moving. Then enjoy those magic words at the red carpet declaring that you are an IronMan! Dan you are a beast! Hold on to that feeling of accomplishment from an Ironman finish, its like nothing else. You progress is fantastic, and shows the rest of us that anything is possible with the right mindset.